Six weeks since my last post! It is shocking how quickly time flies. 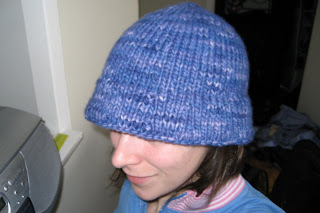 Good news is that although there hasn't been much time for blogging, there has been loads of time for knitting. That means that I should (fingers crossed) be able to start posting on a regular basis again. First up, I thought I should show you some of the stuff I've been working on for Project Spectrum before April comes along and the colours change on me. I was inspired by this to make this. The above photo is taken pre-blocking and this next one was taken post-blocking. It still amazes me how much of a difference a simple dip in the sink makes with most yarns. I made many of the same modifications mentioned here. 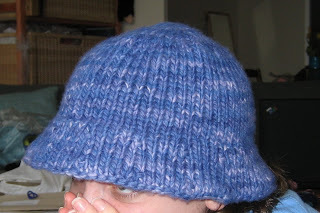 In addition to those I also eliminated the purl ridge at the end of the crown and shortened the depth of the hat. Now back to my Sand Dollar Pullover. Details on that next time. Posted by Amanda at 6:49 p.m.